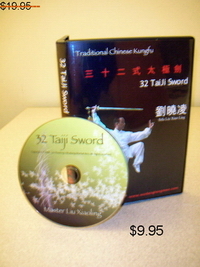 Taiji sword combines the principles of taijiquan and swordsmanship. Its movements are graceful and slow and continuous like taijiquan, while the techniques teach offensive and defensive fighting skills. Correct practice of taiji sword requires harmony of body and sword, coordination of upper and lower body, and synchronization of breath with movement. The practice of taiji sword will help to increase flexibility and strength and enhance the mind-body connection and overall well-being. Please click below to order a copy using Paypal. The DVD retails for $9.95 USD plus shipping and handling. If you have any questions please send us an e-mail with all inquiries. This DVD and its content are © Copyright 2008, in entirety and part, by WuDang Martial Arts and Xiaoling Liu.